This page basically shows you step by step how to remove and install new shocks. With the help of Redshift's tips, I made this page. This is a NOTICEABLE upgrade. 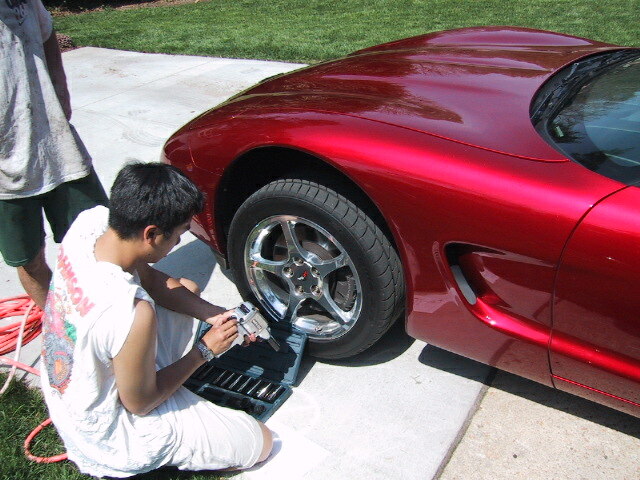 It will lower your car a bit and you will need to get your car realigned when finished. I took the car out on some major twisties and noticed a HUGE difference. The ride is a little stiffer but totally bearable. For a sports car.. it still feels soft enough for city drives, yet it handles really well. I would recommend this to anyone. For about $300 shipped, you cant beat this. This is for non-FE3 cars. I believe the procedure is different for those. Also, use the hardware that Bilstien supplies. Jack, jackstands, bricks, etc for jacking. Following someone's suggestion, I used a nice dose of anti-seize lubricant and silicone spray lubricant on every bushing at every contact point. From what I understand, the squeaking may start to happen anyway, and if so I'll have to re-do the installation, but so far it's been quiet. The front is a little harder because you have to compress the shock so you can squeeze it out of there. Using a jack on the control arm helps a little. Some people have actually removed the control arm... you can do this by removing the 4 bolts... just be careful as there are washers in place behind those bolts. Disconnect the real time damping electrical connector from the shock, if equipped. 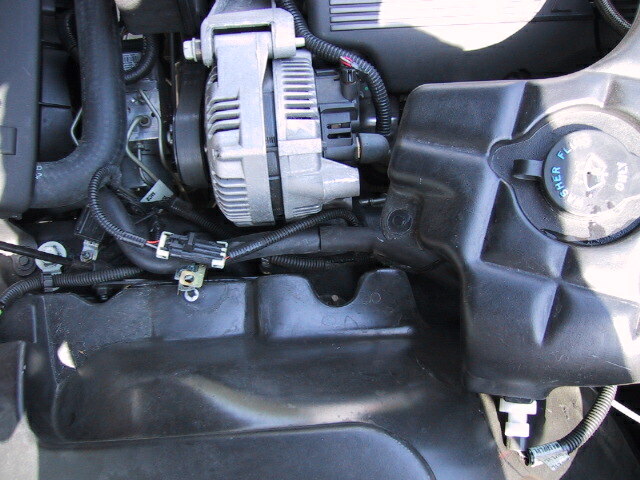 In order to attach the top of the shock, it will be necessary to move either the windshield washer reservoir or the coolant overflow reservoir out of the way. Why? Because you'll need to secure the shaft on the Bilstein with a torx bit while you use an open-ended wrench to secure the nut, and the only way to get the torx bit into the top of the shock is through a small hole which becomes accessible once the corresponding bottle is moved out of the way. This is extremely easy and takes only a minute. Remove the upper mounting nut, insulator retainer, and insulator. Remove the shock absorber lower mounting bolts and nuts. Remove the shock absorber from the upper shock tower and the vehicle. Remove the insulator and retainer from shock absorber. 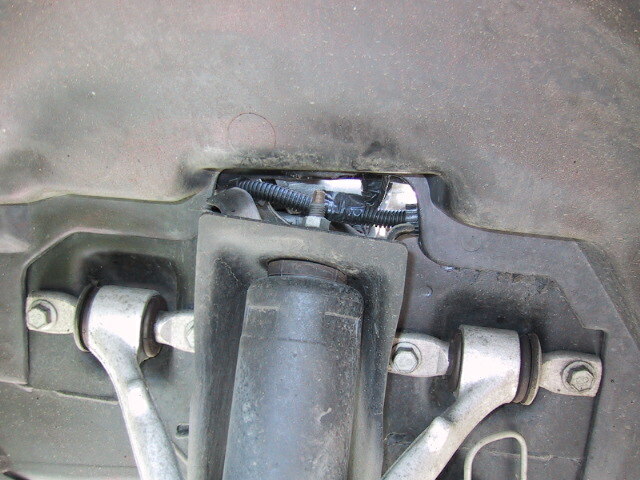 Install the retainer and insulator to the shock absorber. Install the shock absorber to the upper shock tower. Install the upper insulator, retainer, and nut. Tighten the shock absorber upper mounting nut to 26 N·m (19 lb ft). Install the shock absorber lower mounting bolts and nuts. Use a floorjack to lift the entire suspension assembly up until the bottom mounting holes on the Bilstein almost line up to the holes in the lower A-arm. The Bilstein mount will be at the wrong angle, causing the bolts not to fit in right away. What I did was use the largest torx bit I had, and used it on one side of the Bilstein mounting plate, inserted into one hole, to rotate the mounting plate so that the other hole was lined up, and while holding it in place I inserted the bolt on the other side. Once the first bolt is in, it is much easier to get the 2nd in. Then just tighten the nut on the bottom and you'll be all set.Tighten Tighten the shock absorber lower mounting nuts to 28 N·m (21 lb ft). Connect the real time damping electrical connector to the shock, if equipped. You can remove the tie-rod for more room if you like, but you can compress the shock and wiggle its way out. Disconnect the rear shock absorber solenoid electrical connector, if equipped. 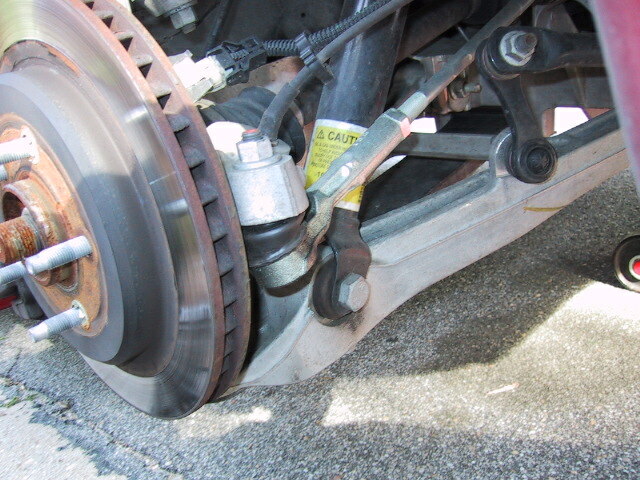 Remove the lower mounting bolt retaining the shock absorber to the lower control arm. Remove the shock upper mounting bolts. 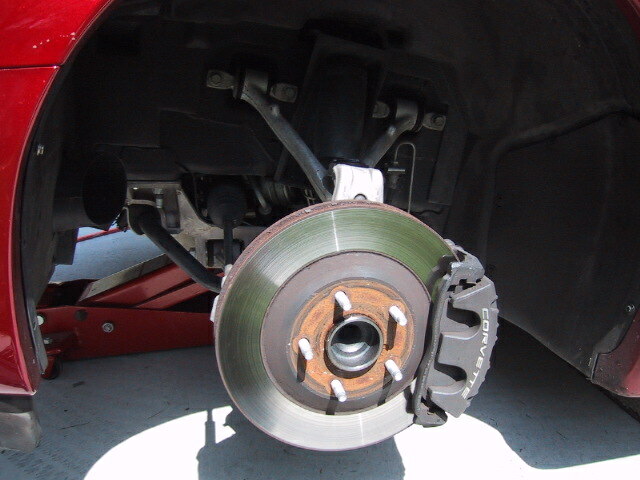 Remove the shock absorber from the lower control arm and shock tower. Remove the upper insulator retainer and insulator from the shock absorber. The plate needs to be transferred over to the Bilstiens. 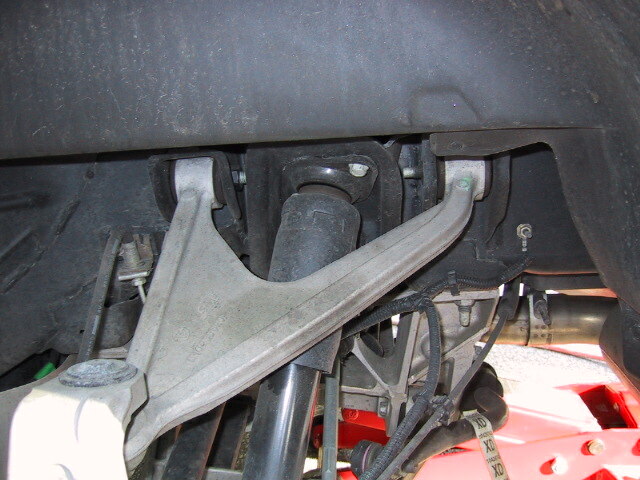 Install the upper insulator and insulator retainer (the plate) to the shock absorber. 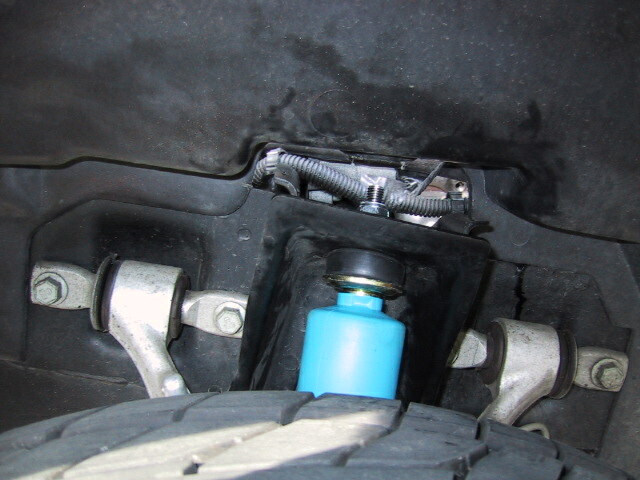 Install the shock absorber to the shock tower and to the lower control arm. It helps to have two floorjacks on hand; one to lift the rear of the car and another to lift the entire A-arm when you go to install the top to mounting plate bolts. Install the upper shock absorber mounting bolts. When doing the top bolts, do the rear bolt first because that one's easier to line up. Do not tighten until the 2nd bolt is in and mostly tight. Once it's pretty tight (not torqued down yet), the plate itself will be physically closer to the other hole, making it much easier to line up. Torque both bolts. Install the lower shock absorber mounting bolt. Tighten Tighten the upper mounting bolts to N·m (22 lb ft). 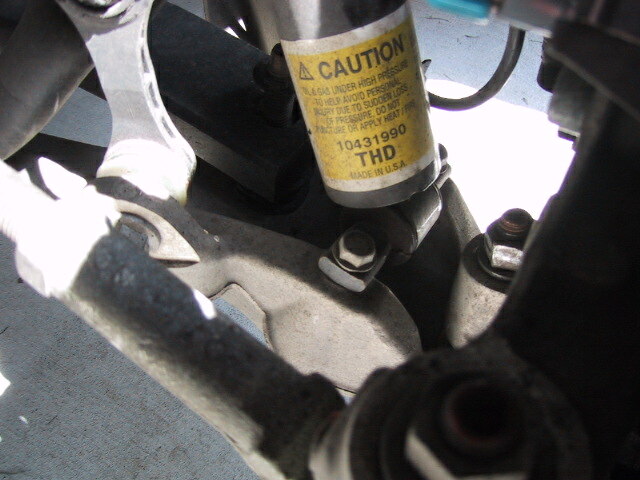 Tighten the shock absorber lower mounting bolt to 220 N·m (162 lb ft). Connect the shock absorber solenoid electrical connector, if equipped.